Hi, we are Andrew Taylor from Taylor Newberry Consulting and Ben Liadsky from the Ontario Nonprofit Network. For the past couple of years we have been working to identify and address the systemic issues that impede useful evaluation in the nonprofit sector. We’ve shared part of our journey with AEA365 previously and now we want to share our latest report. Nonprofits do a lot of evaluation work. However, it isn’t always meaningful or useful. The purposes and intended uses of evaluation work are not always made clear. The methodologies employed are not always aligned well with purposes or with available resources. Sometimes, there is more focus on the process of data collection and reporting than on learning and action. While a lot of attention has been paid to the ways in which nonprofits can alter their practices internally to improve their evaluation capacity, there has been less discussion of the ways in which external factors enable or inhibit good nonprofit evaluation. Funding practices, reporting requirements, information sharing channels, and evaluation standards all help to shape the “ecosystem” within which nonprofit evaluation work takes place. Making Evaluation Work for the Nonprofit Sector: A Call to Action consists of seven recommendations designed to improve the nonprofit evaluation ecosystem. It also includes existing examples of action for each recommendation that can be built on or provide a starting point for next steps. These recommendations have emerged from over two years of dialogue with nonprofits, public and private funders, government, evaluators, provincial networks, and other evaluation stakeholders around the challenges and opportunities to cultivating evaluations that work. Evaluation has the potential to do much more than hold nonprofits accountable. It can enable them to be constantly listening and learning. It can equip them to gather and interpret many types of information and to use that information to innovate and evolve. Without a serious rethinking of the current evaluation ecosystem, nonprofits, governments, and other funders may be unintentionally ignoring key questions that matter to communities and failing to equip the sector to respond in more impactful ways. Ultimately, this position paper should be seen as a conversation starter and a way for all users of evaluation to begin to envision an evaluation ecosystem that, at its core, is more rewarding and engaging for good evaluation work to take place. 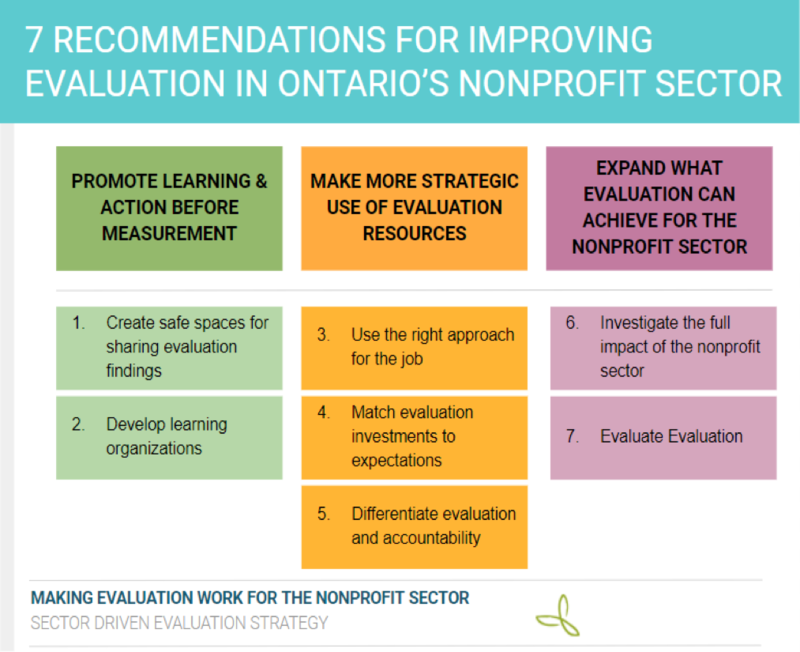 First off, I just want to thank you for putting in the time and effort into doing the research necessary to provide these excellent recommendations for improving evaluation in Ontario’s nonprofit sector. As a student trying to better understand issues in evaluation use, I found your article and the accompanying call to action very enlightening. I appreciate your affirmation of the importance to differentiate measurement work done for accountability purposes more clearly from evaluation work focused on demonstrating meaningful local impact, ongoing learning, and action. As you mentioned accountability evaluations are necessary for funders to determine whether their grant funds were used as planned or whether intended outcomes were achieved. However, you also acknowledged that this constrains the type of evaluations that nonprofits do and the way evaluations findings are used, making it less likely that evaluations address questions that matter to the people served by the non-profit. This is concerning, however, I am optimistic about the new approaches to nonprofit accountability being adopted by some funders in the examples you gave of The Ontario Trillion Foundation and the Atkinson Foundation. As more research and discussions around this topic become more prominent I hope that these types of approaches become the norm. This is really interesting. I really like the term evaluation ecosystem. I was recently involved in a provincial project to look at what is required to build capacity for evaluation in public health units, part of which was a review of strategies needed – a culture of learning was key.